Risk management for energy is more demanding than for other commodities. In most cases the reasons stem from fundamental characteristics that will not change or improve over time. We take a look at some of the important risk management implications of these characteristics in the form of volatility, volumetric risk and basis risk in this article, our second in a series on risk management principles. This is the second in a series of articles on the principles of energy risk management, written by Nick Perry. In this second article we are again putting options aside for now, to focus on ways in which even basic risk management for energy is more demanding than for other commodities. In most cases the reasons stem from fundamental characteristics that will not change or improve over time. We take a look at some of the important risk management implications of these characteristics in the form of volatility, volumetric risk and basis risk. When natural gas became a traded commodity for the first time, levels of volatility were encountered that re-wrote the game-book on what constituted high volatility. For example it is not unusual for spot gas volatility to rise to levels above 100% on an annualised basis, around 10 times greater than spot foreign exchange volatility. When power started to be traded some years later, the books were revised again: electricity is the most volatile commodity ever traded. Spot power volatility can rise to levels above 1000% (annualised). The reasons are clear, and will not change any time soon. These commodities are extremely ‘granular’: gas portfolios must be balanced daily and power in real-time; and storage of both is difficult – in the case of electricity, quite exceptionally difficult. These factors will drive considerable volatility in spot markets for as long as they persist which, being based on the laws of physics, will be for the foreseeable future. And almost every aspect of risk management is made more problematic by high volatility. Volatility is a key driver of the value of asset & contract flexibility. As a result there is an important relationship between volatility and energy portfolio risk, given the inherent flexibility of most energy portfolios. Flexibility can be considered in two categories: owned flexibility (e.g. upstream production flex, gas storage capacity, power plant) and sold flexibility (e.g. gas swing contracts, retail power contracts). Effectively managing sold flexibility exposures against underlying asset positions in energy portfolios, is one of the key challenges of energy risk management (given high price volatility) and one we return to in more detail later in this series. In most commodities, the volumetric aspects of a deal are unremarkable. I buy 10,000 tonnes of steel, and that’s what is delivered. But when I enter a contract for gas and power, as an end-user I will very rarely be able to specify the amount I will buy. On the coldest day in winter, will I turn on every heating appliance in the house – or will I go on a skiing vacation and use nothing? Or cancel my contract and switch suppliers? It is not just retail portfolios that suffer from volumetric uncertainty. Demand for gas and power are remarkably sensitive to ambient temperature; and power plants can trip at any time: just two of the many vicissitudes of the sector. In systems that must balance in real-time, such uncertainties – often termed Volumetric Risk – present very complex challenges (and, incidentally, contribute significantly to the volatility mentioned above). Once again, this problem is far more acute in energy than in any other commodity. Take the prompt exposures of a vertically integrated power portfolio as an example. The portfolio needs to be broadly balanced in real-time to avoid exposures to very volatile prompt and balancing prices. Volumetric risk in the portfolio stems from the flexibility sold to customers via retail contracts. Customer load may swing substantially over short periods (e.g. given changes in weather conditions). Given short term market liquidity constraints, this exposure is often managed via ownership of flexible power plants (e.g. gas peaking assets). However forced outages on generation assets can add to the complexity of volumetric risk, given that these may leave wholesale contract and retail positions exposed to volatile prompt prices. Delivery point: the complexities of transportation for gas and power, and sometimes also coal and even oil, mean that end-users and smaller wholesale players are often uncomfortable with taking settlement at one of the handful of delivery-points at which hedges are most readily found, which may be a long way from their ‘natural basis point’. Thus, locational basis is a very common issue in energy markets. For example, liquidity in European coal is focused around API2, a specified set of conditions for delivery of coal to Amsterdam- Rotterdam-Antwerp (ARA). Yet many owners of European coal-fired plant use API2 contracts to hedge coal delivery to locations which are separated both geographically and logistically from the ARA area. Quality / specification: there are very many grades of oil and coal, but hedges only exist for a handful of grades. The well-traded hedging grades will for the most part be highly correlated with other grades, but not perfectly so: and small differences multiplied by large volumes over long periods of time can add up – particularly for the many energy players operating a margin business model, such as refiners, thermal generators and retailers. Worse still, even high correlations can break down over time. Chart 1 illustrates perhaps the most famous recent example of WTI and Brent, the two most commonly-traded crude-oil blends which are of slightly different quality, with delivery-points in the USA and Europe respectively. 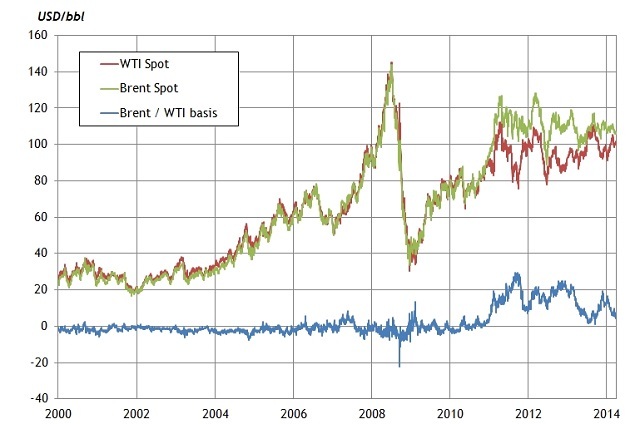 From being very well correlated for many years, starting in 2011 the price of WTI relative to Brent collapsed (as a result of a flood of new unconventional domestic oil production in the US and constrained local infrastructure). It is a fact that, based on the years of good correlation, some US oil-market participants hedged their European oil exposures using WTI, an instrument they were very familiar with. The correlation breakdown uncovered an unwelcome basis risk exposure behind their apparently hedged positions. Although electricity and natural gas do not have ‘grades’ in quite the same way as oil, power is commonly traded as ‘baseload’ and ‘peak’ despite more granular underlying exposure shape; in Northern Europe there is a low-calorific ‘grade’ of gas alongside the usually-traded hi-cal commodity; and in both markets, weekend prices are not identical to weekday prices. Here again, basis risk can complicate a hedging strategy. In any commodity, deployment of risk management tools for even ‘simple’, linear exposures hinges materially on market liquidity – the ready availability of spot and forward deals that enable portfolio imbalances and exposures to be managed. But because of the unique difficulties associated with gas and power discussed above, and exacerbated by global financial conditions, gas and power market liquidity is frequently unsatisfactory. This leads some players to assert that vertical integration is a necessary base for risk management in large energy companies – an uncomfortable conclusion for regulators and other energy-market stakeholders who consider that open, competitive and liquid markets are critical to ensuring secure and economically efficient supplies. Whatever stance is taken on the issue of vertical integration, the compounding difficulties of market fundamentals and liquidity result in considerable premium being placed on pragmatism and experience in energy risk management, in parallel with excellent technical skills. They also dictate an emphasis on flexibility within the portfolio itself. And since flexibility translates into optionality, we quickly find ourselves needing to wrestle with the complexities of risk-managing options! It is to this that we turn in the next part of the series.